A glass bottle inside of a weaved wicker basket. 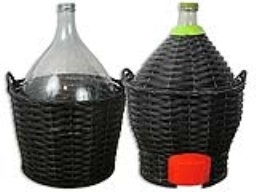 The wicker helps give resistance to breakage of the glass inside. Used for storage and fermentation. Please note: this is an oversize item - please contact us for actual shipping charges.